A short summary of the lectures Casey Reas and Marius Watz at Lume Media Centre, an event which was organised by PixelACHE & friends (see earlier posting). Casey and Marius arrived to Helsinki straight from the Generator.x conference / exhibition in Oslo, an ambitious project initiated by Marius Watz. Generator.x brought together an international group of artists / designers / researchers to explore ‘the current role of software and generative strategies in art and design’. The ability to ‘read’ a medium means you can access materials and tools created by others. The ability to ‘write’ in a medium means you can generate materials and tools for others. You must have both to be literate. In print writing, the tools you generate are rhetorical; they demonstrate and convince. In computer writing, the tools you generate are processes; they simulate and decide. Casey mentioned book ‘Vehicles, Experiments in Synthetic Psychology’ by Valentino Braitenberg as an influential source for his earlier projects such as tissue software. There is an article by Casey about this in the Ars Electronica 2003 catalogue. * Work is non-material and in it’s essence can be described as a set of instructions (Casey). Casey told that some sources of inspiration for his recent work are artists like Sol LeWitt, Yoko Ono and John Baldessari. These artist have created projects which are simple instructions for a performance. The instructions always contain a certain amount of ambiguity and therefore each performance (each instance of the work) is unique. Casey has transformed this same logic into his software projects in search for a similar ambiguity and a more ‘pure’ manifestation of his work (here is an article by Casey describing the relationship of software and the work of Sol Lewitt). 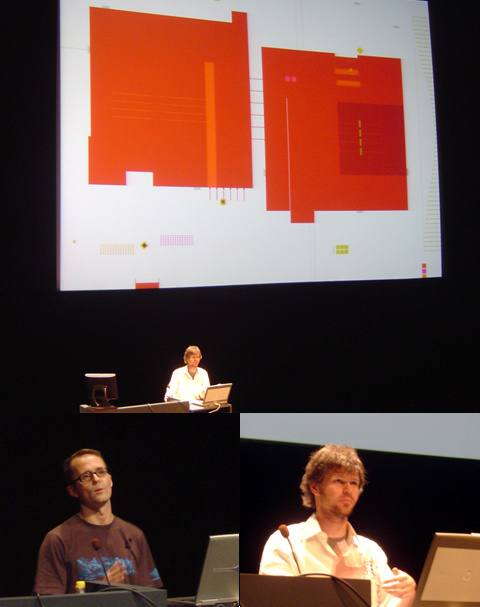 Both Casey and Marius thought that the correct way to show their work is to show the software ‘running live’ on a computer. The result can run on a better resolution and framerate than video or DVD and also the work has it’s generative character – the work is different every time it’s viewed. Casey also gave a short presentation about the Processing software development environment. Casey is the other main developer of processing, a project which he initiated together with Ben Fry. Casey told that the goal for processing tool was to ’spawn a programming culture for design and arts community’. This sounds like a grand undertaking but Processing has so far reached a pretty good position in this regard. - “If people get it, it doesn’t matter what it is.” (Marius Watz). We spoke about the context for generative art/design and specifically about artist LIA who crosses back and forth over the boundaries of art, design and club culture but refuses to provide any rational explanation of her work or her obscure interfaces. The comment from Marius is a positive view that ‘good art/design will win at the end’, regardless of who did it and why/how it was done.